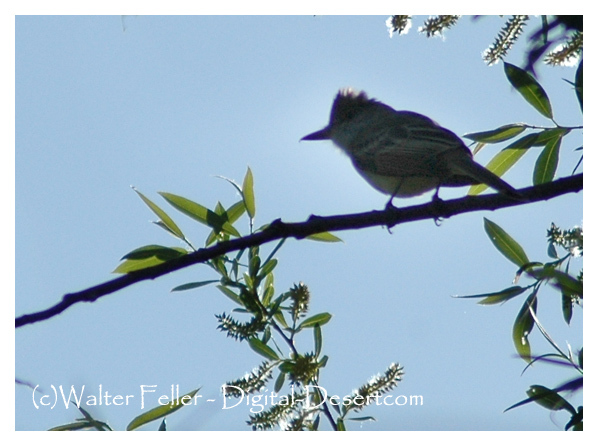 A passerine bird in the tyrant flycatcher family. It breeds in open woodland from southern California, southern Nevada, central Arizona, and southern Texas southward to Argentina and Bolivia, and on Trinidad and Tobago. It is resident in most of its range, but American breeders retreat to Mexico or southern Florida in winter. Adult Brown-crested Flycatchers are 20.3cm long and weigh 30g, and have heavy bills. The upperparts are olive brown, with a darker head and short crest. The breast is grey and the belly is lemon yellow. The brown tail feathers and wings have rufous outer webs, and there are two dull wing bars. This species is a rather skulking insectivore which catches its prey by flycatching amongst the undergrowth.